It's better. It's that simple! There are numerous articles around the pros and cons of Grass Fed versus Grain Fed beef and the impact on our health. The fact that you are reading this may mean that you are considering buying or have bought from The Free Range Butcher and are therefore conscious of how your meat is produced and how this effects your own health. We are very conscious of this too and are passionate about free range, grass fed meat. Our animals are farmed in the traditional way, they are allowed to roam the paddock and graze as they please; they are also free of antibiotics and hormones. What is the issue around Grain Fed Meat? Most beef produced and finished in Australia for local consumption is fed a grain mix used to fatten them up quicker. This would be all well and good if a cow's digestive system was designed to digest grain – but it wasn't. Grass eating animals such as cows and sheep have a rumen which acts like a fermentation tank containing necessary bacteria to break down the grasses and convert them to protein and fats. "Perhaps the most serious thing that can go wrong with a ruminant on corn is feedlot bloat. The rumen is always producing copious amounts of gas, which is normally expelled by belching during rumination. But when the diet contains too much starch and too little roughage, rumination all but stops, and a layer of foamy slime that can trap gas forms in the rumen. The rumen inflates like a balloon, pressing against the animal's lungs. Unless action is promptly taken to relieve the pressure (usually by forcing a hose down the animal's oesophagus), the cow suffocates." This obviously isn't good for the cows, and we're eating these cows so what are the consequences for us? Grain fed animals that are continually fed antibiotics to survive which leads to the development of antibiotic resistant bacteria. These are the "superbugs" that are increasingly rendering our "miracle drugs" ineffective. It is also the reason for the heightened prevalence of E. coli O157:H7, found in an undercooked Hamburger. In some people, this type of E. coli may also cause severe anaemia or kidney failure, which can lead to death. 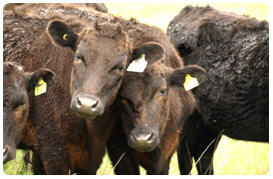 We understand that quality Grass Fed Meat isn't as cheap as the mass produced grain fed varieties. But what price do you put on your health? Our general belief on things like this is we're better off having a little of the good stuff, rather than loads of the not-so-good stuff. Livestock grazed on pastures absorb a pigment from the grass called carotene (the same pigment that makes carrots orange), which can result in fat that has a yellowish tone. This has no effect on the eating quality whatsoever, however if consumers have been eating grain fed meat, they will be used to fat that is whiter in colour. Grass Fed Meat does have a different taste - rich and earthy - compared to grain fed meat. This difference in flavour is due to the variety of pastures that the cattle have in their diet. Conversely, the high energy content of the grain based mixes makes grain fed meat taste 'sweeter' and over many years, the human palate has become accustomed to this sweeter taste. Personally we love the flavour of Grass Fed Meat; as a bonus we believe its bold flavour means there's no need for marinades or sauces – salt, pepper and olive oil is all you need.